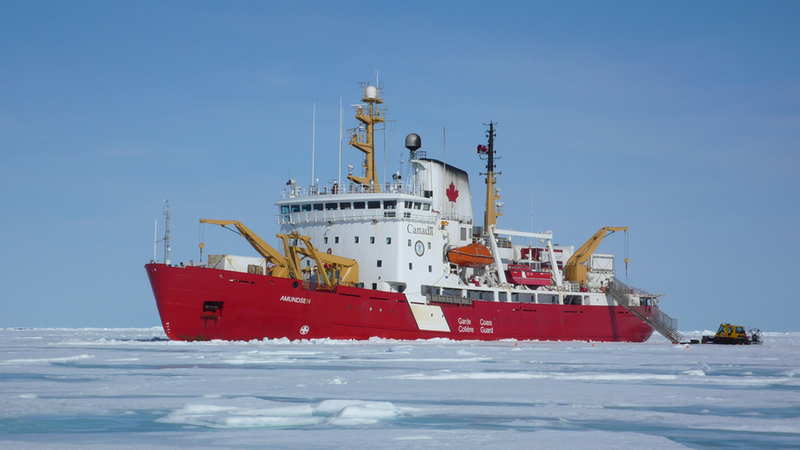 GreenEdge scientists left for 2 months during the summer, in the Arctic aboard the research icebreaker CCGS Amundsen. They carried out observations intended to improve their understanding of the behaviour and the role of the marine ecosystem in Baffin Bay. Within this framework, the communication team coordinated by Julie Sansoulet, with the collaboration of Pascaline Bourgain, set up an original and innovative teaching device intended for primary school students (8-10 years), which enabled them to discover the Arctic (environment and population), the scientific and non-scientific crews of the Amundsen, and the challenges of the undertaking research in the area. The educative mediator, in charge of this educational project, took part into the expedition and met with 5 classes in partner schools from the Ile-de-France region to present our scientific mission. The students worked as groups in order to identify a certain number of questions (a confounded set of themes: science, environment, life on board, icebreaker, etc.). The choice of topics covered was made in line with the state education programs. The students provided assumptions with respect to the responses to their queries. The students were recorded asking the selected questions (on video if parental authorization is obtained, otherwise by audio). The students contributed to the video and sound recordings. Short-films of one to two minutes in length were produced in response to each identified question (while answering directly to the students). Therefore, 20 different people were interviewed on board to answer the children questions : scientists of course, but also the doctor, the coast guards, and even the captain ! During the research icebreaker mission, teleconferences were organized with the 5 partner classes, enabling them to interact directly with the team members, live from the Arctic. During the Festival of Science week, Pierre Coupel who participated to the expedition as a marine biologist, came to Paris to present the expedition and its scientific challenges. While 5 classes were present at the conference, many others followed by internet and ask their questions through Twitter (#ConfGreenEdge). This was an amazing opportunity for many young students to interact directly with one crew of the mission ! Thanks to the 20 short videos, the students will keep discovering the scientific expedition in an entertaining way in a classroom setting.